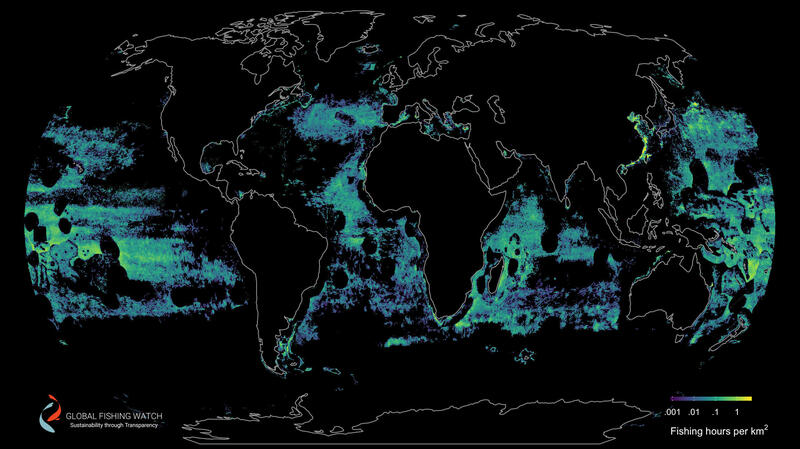 A global map showing where all fishing vessels were active during 2016. Dark circles show the vessels avoiding exclusive economic zones around islands, where they aren't allowed. This map shows fishing by trawlers, which drag fishing nets behind them. They dominate fishing in coastal areas, such as fisheries near Europe and China. This map shows activity of fishing vessels that use drifting longlines. They roamed the high seas, especially in tropical latitudes. But this week, the journal Science published some remarkable maps that help fill that gap. John Amos, president of an organization called SkyTruth, which helped produce them, issued a statement calling the maps "a stunning illustration of the vast scope of exploitation of the ocean." SkyTruth and its collaborators tracked most of the world's fishing vessels through an entire year by monitoring radio transmissions that most vessels now emit automatically in order to avoid collisions with each other. The researchers were able to distinguish between different kinds of vessels — trawlers that drag nets behind them, for instance, versus vessels that deploy drifting "longlines" that often are used to catch tuna. 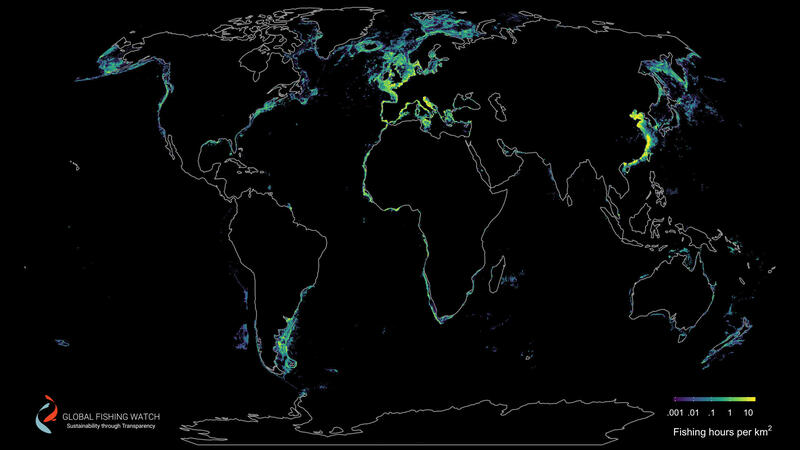 The maps show the most intense fishing activity along the coasts of heavily populated areas like Europe and China. But fishing also covers much of the high seas. According to the researchers, commercial fishing operations covered at least 55 percent of the world's oceans. That area, it calculates, is four times larger than the area devoted to agriculture on land. In addition to SkyTruth, researchers from Global Fishing Watch, the National Geographic Society's Pristine Seas project, University of California Santa Barbara, Dalhousie University, Google, and Stanford University collaborated on the study.